2010 Audi A8 to get November debut? 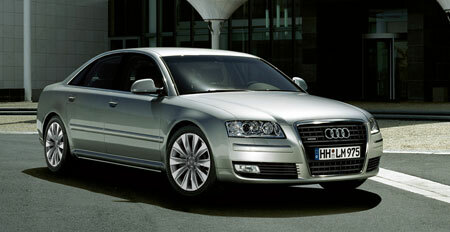 Home » Cars » Audi » 2010 Audi A8 to get November debut? An all-new Audi A8 is set to be unveiled in November this year for the 2010 model year, something that I am quite eagerly awaiting to see, as most car manufacturers put most of their best stuff in their flagship models. The current A8 has been soldiering on since 2003 and a full model change is quite timely with German luxo-marque’s typical 7 year model lifecycles. The S-Class received a mid-life facelift this year and Munich’s offering got an all-new model change last year, with the flagship just announced, chock full of 12 cylinders, 2 turbochargers and 8 forward ratios. It’ll be interesting to see what the flagship motor of the Audi A8 will be this time – in the last installment it was the massive 6.0 litre W12, putting out 443 PS and 580Nm, taking the monster up to 100km/h in just 5.1 seconds. I won’t be surprised if the flagship is a diesel this time! Look after the jump to check our a previously posted trailer of the movie Transporter 3, which features the Audi A8 that we will be soon saying goodbye to. Previous Post: Audi Q5 in Malaysia: RM299k to RM325k!